NE takes lead 24-20 with 2:48 left. FOXBOROUGH, Mass. (AP) — Patriots beat Jaguars 24-20 in AFC championship game, advance to 8th Super Bowl for coach Bill Belichick, QB Tom Brady. 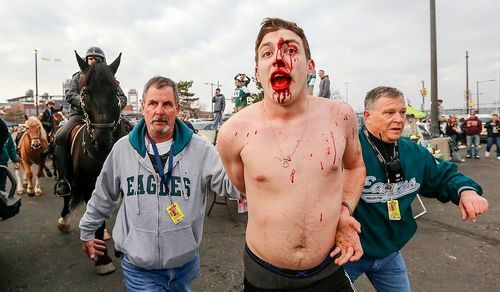 A fight broke out in a parking lot near the Philadelphia Eagles' home stadium as police tried to disperse tailgating fans hours before the NFC Championship game. After trailing by 10 points early in the fourth quarter, the Patriots cut it to three on Tom Brady's 9-yard pass to Danny Amendola and then went ahead on a 4-yard throw to Amendola in the back of the end zone with just under 3 minutes left. Amendola also had a 20-yard punt return that allowed New England to start the go-ahead drive at the Jaguars' 30. The Patriots have won the last three playoff games they've trailed by double-digits in, including a 25-point deficit they erased in last year's Super Bowl.